MSNBC's Ari Melber said Wednesday that the legal case against Democratic Sen. Bob Menendez (N.J.) in his federal corruption trial looks "overwhelming." Menendez's trial is the first for a senator for federal bribery in 36 years. Federal prosecutors have alleged Menendez "sold his office for a lifestyle he couldn't afford" through a friendship with a wealthy Florida ophthalmologist who sought favors and political influence in return. "Now the case against Menendez as a legal matter doesn't look close, it looks overwhelming," Melber said. Melber attempted to compare Menendez's corruption case to that of former Virginia Gov. Bob McDonnell (R.) but noted the Supreme Court had vacated McDonnell's conviction. Menendez has professed innocence and insists he will be vindicated. "We don't know what will happen and if he'll be vindicated," Melber said. 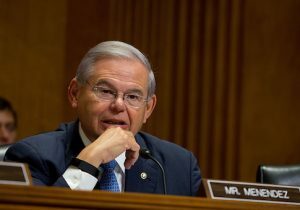 "But if a politician can take the kind of gifts that Menendez already has taken and be acquitted, then you have to ask if there's something wrong with all of these corruption laws in the first place." Wednesday was the first day of Menendez's trial. His attorney was told by the presiding judge to "shut up for a moment" in the courtroom.